Wherever people are, there is conflict. Conflict is a difficult topic for a Christian. We know it’s a problem, but sometimes there seems to be no way out. We wonder how to end it. We do not understand how to avoid it. And, according to author Lou Priolo, we do not know how to start it appropriately either. 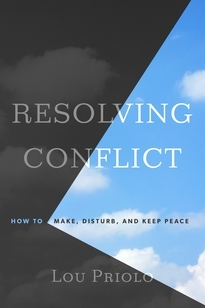 So Priolo wrote Resolving Conflict: How to Make, Disturb, and Keep Peace. Basing his book on Ephesians 4:1-3, he first discusses characteristics needed to resolve conflict and secondly outlines biblical principles of conflict resolution. Following this text, Resolving Conflict’s first section deals with humility, gentleness, patience, and loving forbearance. It discusses these character qualities in great detail, talks about their opposites, includes checklists for the reader, and gives practical advice. These first chapters are foundational to what comes later, as Priolo reminds us that we cannot speak what is good during a conflict unless the Holy Spirit is sanctifying our hearts. There is work for us to do here, through the strength of the Holy Spirit. This work, in obedience to God’s Word, is the basis for the second half of the book as well as a part of every Christian life. This second half of Resolving Conflict is very practical in a different way. Carefully Priolo outlines three different types of conflict (due to differentness, due to sin, or due to disagreements about what is right), showing how these different types of conflict require different solutions. He discusses communication, responding to reproof, the heart of conflict, unbiblical internal and external responses to conflict, conflict resolving questions, how to respond more biblically, and how to reorient a conflict gone bad. Finally he returns to Ephesians 4, focussing on the last verse: “…eager to maintain the unity of the Spirit in the bond of peace.” He calls it “The Hidden Prerequisite” and points out that we are called to be active and diligent in this. There’s a balance, not an opposition, between prayer and diligent effort, and an even deeper, though more contested, one between the Spirit’s work and ours. This section, too, is filled with pointed questions to the reader and it, too, emphasizes that not all conflict is the result of sin between people though all conflict can easily lead to sin. I have been reading Resolving Conflict off and on since it was published in late 2016, rereading section after section, filling out the reader checklists, and stopping in dismay to ponder their results. The first section, especially, was helpful in a personal sense. The second section, much more practical in terms of actual conflict, also demands a lot of careful thought as well as prayerful action. Finally, I reread the book as a whole. It is a lifechanging book in many ways, as anyone who diligently works through it will discover. I plan to continue studying it off and on well into the future. This book does rebuke and wound, but the wounds are those of a friend and a shepherd. They bring healing and wisdom. However, not all Christians will want to follow Priolo’s suggestions or appreciate his style of teaching; we are all different and, besides the Bible, there is no book that speaks to everyone. One major stumbling block could be the scripted conversations but they should be used as examples, not memorized or quoted unless that is the way one actually speaks. Some will object to the detailed checklist approach that the author uses, although others will find it very helpful. Some can apply a text like Ephesians 4:1-3 to their own lives without such careful guidance. Despite this, I highly recommend Resolving Conflict to all Christians. The first part, explaining the passage from Ephesians 4 quoted above, makes this command of Paul practical, something we all need. The second part, dealing with conflict between two people, could make an enormous difference in individual lives and in church life. I learned a lot from this book and expect to continue to do so. Does this book have a place in the homeschool? Certainly all families would benefit if the parents absorbed its lessons. Some teens would benefit from studying it, but I cannot see most teens doing so; instead it is a good resource to study with a bit more maturity. Note: There is already a classic on a similar topic by Ken Sande, The Peacemaker, based on Matthew 18:15-20. Lou Priolo’s Resolving Conflict, based on Ephesians 4:1-3, is different in that it focuses exclusively on the beginning stages of conflict and tries to resolve it at that stage by promoting a biblical mindset. The Peacemaker would be a helpful companion volume and Priolo recommends it enthusiastically. Disclosure: I recieved a review copy of this book from the publishers and have given my own opinion. I am grateful to P&R Publishers for their patience in waiting for this review and for their wisdom in publishing this book. May it bless many. Posted in: 52 Books in 52 Weeks, Life, Reviews, Reviews: Nonfiction, Reviews: Reformed.